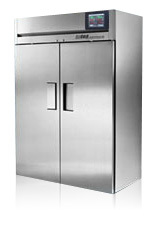 Over sized refrigeration system for fast temperature pull-down and recovery times. Using hot gas bypass refrigeration with microprocessor-based PID controls, we are able to control temperature at ± 0.3°C during normal operation. Standard temperature range is -25°C to 0°C. Additional models to -40°C are also available. The test of a stability freezer is in the defrost cycle: How often is a defrost cycle required? How long does the cycle last? And what is the temperature upset during the defrost cycle? On our stability freezers, we combine a side wall plenum with aluminum heatsink to minimize temperature rise during defrost, so as to maintain chamber air temperature below -15°C in a loaded chamber even during defrost cycles. The frequency and duration of defrost cycles required is directly related to the ambient conditions of the facility in which the freezer is located, and the number of door openings throughout the day. The more moisture in the ambient air, the more frost will form on the coil when the door is opened, necessitating more frequent defrost cycles.